Yuma Rotary has not only sponsored the Teacher of the Year Banquet for decades to celebrate our educators but we've also proudly served them and their guests our famous Tri-Tip dinner. This one day event will require food prep, facility prep, servers and clean up crew. We are calling all Yuma Rotarians to sign up for one or two shifts. The event goes by so quickly because you are completely surrounded by awesomeness!!! Mark your calendar and watch your email for event sign up in March. Vamos a celebrar la fiesta de Cindo de Mayo! Or, Let's pour some beers and have an awesome time at the Cinco de Mayo Block Party in beautiful downtown Yuma! Yuma Rotarians are asked to sign up for one or two shifts, the time will fly by with laughter and camaraderie! A portion of the proceeds/tips will be donated to Yuma Rotary to be put towards local projects/scholarships. Mark your calendar and watch your email for event sign up in April. Yuma Rotary has not only sponsored the Athletic Sports Banquet for decades to celebrate our local athletes but we've also proudly served them and their guests our famous Tri-Tip dinner. This one day event will require food prep, facility prep, servers and clean up crew. We are calling all Yuma Rotarians to sign up for one or two shifts. The event goes by so quickly because you are completely surrounded by awesomeness!!! Mark your calendar and watch your email for event sign up in April. 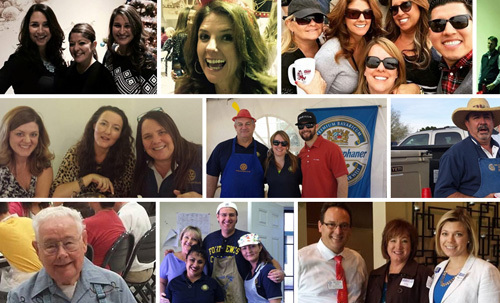 Yuma Rotarians please join us for a heart-warming event as we congratulate Mike Mitchell for his service as Yuma Rotary President, welcome Page Misenhimer as our new incoming President, and install our new board of directors. The location has not yet been determined, but check back often for updates! If you love music, dancing, singing and laughter, then the Killer Dueling Pianos is where you need to be! This fun filled event starts out with heavy appetizers, cash bar, hilarious piano players and even funnier crowd participation! This fundraising event is not just for Rotarians, so please invite your friends - and LOTS of them so we can raise a bunch of money for local projects/scholarships and have a great time! For 60 years Yuma Rotarians have proudly and honorably hosted the annual Walt Kammann Sausage Fry. We are calling all Yuma Rotarians to not only sell tickets to the event to your friends, colleagues and out in the community but also need you to sign up for one or two shifts. This one day event will require food prep, facility prep, servers and clean up crew. The event goes by so quickly because you are completely surrounded by awesomeness!!! Mark your calendar and watch your email for event sign up in October. Save the date - we'll be planning an awesome time!